What if the story we know is not the story that happened? 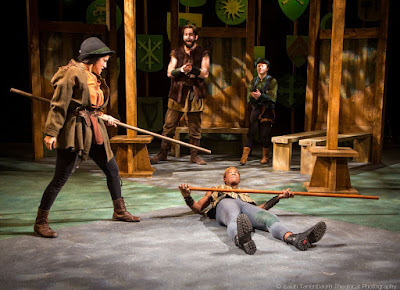 In Flux Theatre Ensemble’s Marian, or the True Tale of Robin Hood, Adam Szymkowicz takes the playfully colorful story of Robin Hood and twists it in a manner that it’s no longer as straight as an arrow. In Szymkowicz’s version, the titular character is, spoiler alert, actually Robin Hood. The comedy tries to shoot down gender norms through the lens of a well-known story but it’s anything but a bullseye. Marian, or the True Tale of Robin Hood follows Marian as she lives a double life as the heroic outlaw Robin Hood, stealing from the rich and giving to the poor. Though an explanation of her intentions is never really solidified in the text, Marian, as Robin, leads her band of Merry People through Nottingham and Sherwood Forest on a crusade of righteousness. On the page, the text leaps off as a raunchy comedy. On the stage, this production was anything but. Our modern lexicon of Robin Hood is bogged down by Hollywood adaptation. Between Disney’s animated film where animals take on the roles and the action adventure versions where Robin gets played by people like Kevin Costner and Russell Crowe. When it comes to Robin Hood and comedy, no one quite does it like Mel Brooks. But Adam Szymkowicz sure tries! The thing about Marian is it could be hilarious while still exploring modern gender theory but the execution of this particular production had woes when it came to tonal consistency. Director Kelly O’Donnell seemed to struggle with the overall execution. When the audience strains for laughs in a comedy, something misfired. The script is silly. To allow the implausibility of the plot, the characters had to be dumbed down and boy were they dumb. But O’Donnell asked her company to find far too much truth and honesty that it didn’t match. With medieval sensibilities exploring modern themes, teetering the line between comedy and sincerity caused some moments to become borderline uncomfortable. There were some beats that were played dramatically that didn’t quite have the dialogue to support it. The director’s vision is all about how they interpret the material. O’Donnell was at least consistent in how she approached the story. Aside from avoiding campiness, O’Donnell had some hurdles in her way. Comedy needs to be fast. Marian was anything but. And it may have much to do with O’Donnell’s trouble staging. Visually, Willy Lowry’s scenic design was Medieval charming. Extending the design into the audience allowed the superfluous narration to feel warranted. But for O’Donnell’s purposes, the set was a detriment. For a story that moves from location to location, the scenic elements were clunky, often causing the momentum to drop. Sure, the royal banners helped to spell out location but they didn’t need to be flipped in every scene shift. Seconds count! Keeping there would have been just fine. Overall, costume designer Izzy Fields nailed the period with style and grace. The color pallet was muted yet had flash. But there was one integral costume that floundered. To put it bluntly, without knowing what you were seeing, you might confuse Robin Hood for Peter Pan. With the nature of the piece, moving in and out of disguise and some of the fight choreography, keeping the archer’s hat on is important. But the elastic or string keeping it in place was a bit distracting. As mentioned before, the characters needed to be pretty witless to know that Marian and Robin Hood are not one in the same. Not having some sort of goatee or facial hair was a missed opportunity. It’s a little thing but it had a big impact. This gender-bending Robin Hood tale is funny. There’s proof of that. The sole actor who seemed to understand the tone of Szymkowicz’s writing was the incomparable Kevin R. Free as Prince John. Free had the audience in stitches. And rightly so. Comedy seems to come easy to him. He created a character all of his own that made you wish there was a spin-off in the works. His classic comedic sensibility was the highlight of the play. With that being said, the rest of the company needed to match Free. Jack Horton Gilbert as Little John, Mike Mihm doubling as Friar Tuck and Sheriff of Nottingham, and T. Thompson as Will Scarlett had some great moments, bringing fun and laughs. Taking on the narrator and the straight role in the piece, Jessica Angleskhan as Alanna Dale was striking. Alanna may not have been the focal character but Angleskhan made you wish she was. Leading a merry band of robbers is no easy feat. Impersonating the most infamous archer in the Sherwood Forest while having a huge secret while leading a merry band of robbers seems like a tough task. But the reality is that there is extraordinary potential for comedy. Unfortunately Becky Byers as Marian slash Robin Hood felt miscast. Her comedic chops didn’t seem to land anywhere near the target. Robin Hood is a powerful presence but if the biggest joke was the feistiness despite her small stature compared to the rest of the company, then the payoff wasn’t there. Byers is a strong performer but this role seemed like a strain. The concept of Marian, or the True Tale of Robin Hood is quite promising. But when the comedic execution didn’t match the map within the text, the production fell flat. Not every show can be a winner. Sadly, Flux Theatre Ensemble didn’t have a champion here.